Come & collectively practice, flow, learn, workshop, collaborate, grow vocabulary and/or share skills with others in an empowering & open-minded community. 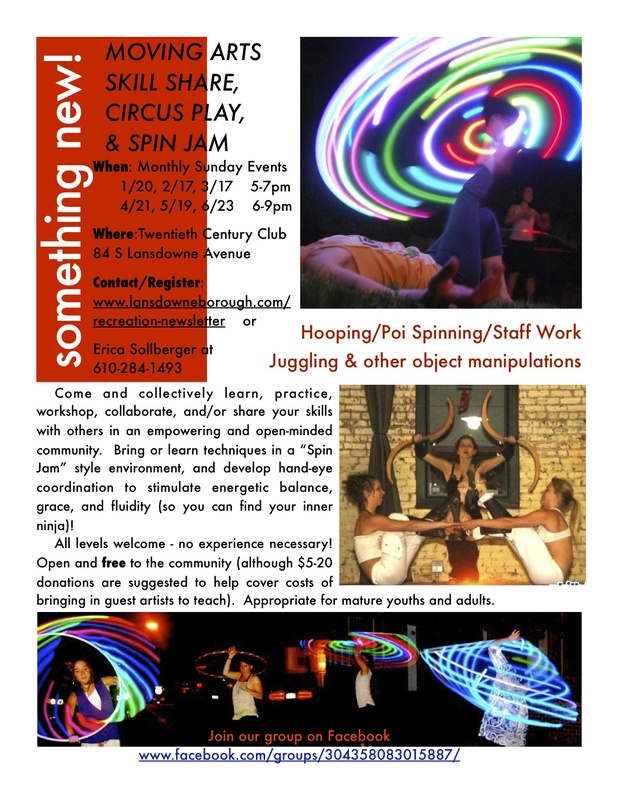 Hooping techniques, Staff work, Poi play, Contact Juggling & various Object Manipulations are welcomed in a flowing “Spin Jam” style environment. The jams are social events with a relaxed atmosphere and little instruction (unless a specific guest artist is scheduled to facilitate a workshop). Develop hand-eye coordination to stimulate energetic balance, grace, & fluidity (to find your inner Ninja)! All levels of experience are welcome to participate. Appropriate for fun-loving mature youth & adults. Open and free to the community (although $5-$20 donations are particularly helpful to cover costs to bring in special guest artists)! 1/20, 2/17, 3/17, 4/21, 5/19 & 6/23 (5-7pm Jan.-March/ 6-9pm April-June)! All workshops held at the Twentieth Century Club, 84 South Lansdowne Avenue, Lansdowne, PA! Gabrielle dragonesss@earthtones.com & Michelle mroarmour@gmail.com to RSVP! ← Yoga Therapeutics Class Mondays 1/14, 1/21 & 1/28!